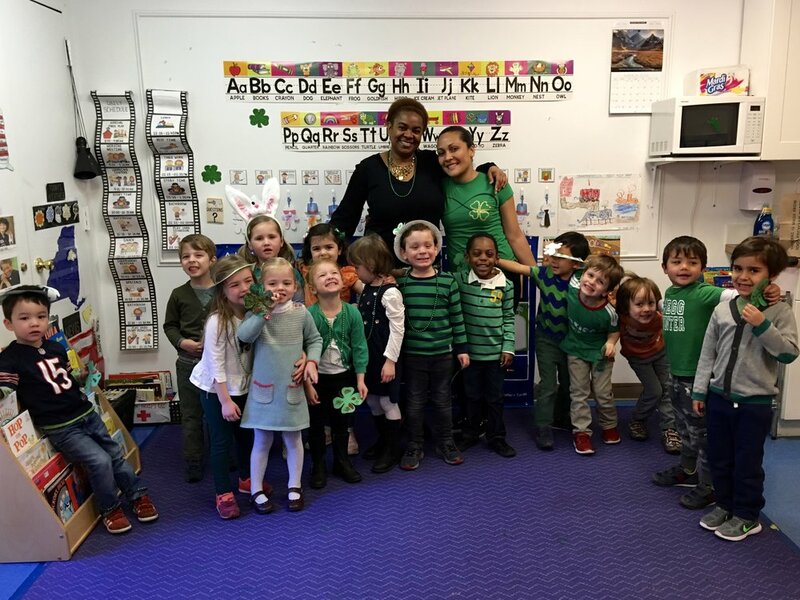 The Jack & Jill School, located at St. George's Church in NYC, is a non-sectarian school for children ages 2 1/2 to 5 years old. This community preschool offers a private playground, an indoor gym, a Spanish program, music/movement classes, an early literacy curriculum and a creative arts program. The Jack & Jill School was established in 1949 as an institutional part of the Parish of St. George's Church to provide quality education for preschool age children. The mission of the school is to create an atmosphere compatible with the needs of young children who are developing socially, emotionally, and intellectually in varied and individual ways. The program is strictly non-sectarian and draws from the Parish and neighborhood families. The school continues to exist under the sponsorship of the Parish, which encompasses St. George's Church on Stuyvesant Square, and Calvary Church on Gramercy Park. Jack and Jill upholds its effective tradition of helping children to become active participants in the learning process with an interactive playgroup for 2-year-olds and separate preschool programs for children ages 2 1/2 to 5 years old. In a cozy and nurturing environment, all age groups are involved in hands-on activities fostering experimentation. Based on a whole child approach, a dedicated group of well-educated teachers use positive reinforcement as key to further the joy and challenge of learning. In a sequential manner, students develop and build a variety of skills as they learn to make their own choices and become more confident in their capabilities. Children proceed at their own pace in an individualized program including letter and number experimentation in an early literacy curriculum, story time, art, music and movement, Spanish classes, and a rich science curriculum. In addition to bright, cheerful classrooms, Jack and Jill has a large outdoor play yard and an indoor gym space. Unique not only describes the primary characteristics of each child, but also the developmental process of every program offered at Jack and Jill - where learning is a hands-on adventure and a secure foundation for future formal learning is well established. Applications for the 2017-18 school year will be available on-line, Tuesday September 6, 2016. The application deadline is Tuesday, November 15th. Upon receipt of your child's application, we will schedule you for a Parent Tour. These tours are conducted in small groups during November and December. Subsequently, in January or early February we will invite your child to a Playdate at the school. Admissions decisions will be released via email on March 1, 2017, pursuant to the Independent Schools Admissions Association of Greater New York rules. Children applying to our Young 3's must be 2 years of age as of April 1st of 2017. Children applying to our Young 4's must be 3 years of age as of April 1st of 2017. Children applying to our 4/5's must be 4 year of age as of April 1st of 2017. Playgroup - A "First School" Experience at 61 Gramercy Park North - Children ages 20-30 months; 2 or 3 classes per week with parent (caregiver) on premises;. Experienced Early Childhood Teacher; Art, Music and Storytime; Snack; Themes explored such as Transportation, Shapes and Seasons. Well-equipped classroom with slides, riding toys, puzzles and games. Children enjoy interactive play as they gain language and social skills with the help of the Resource Teacher. Interested Parents may view a class.